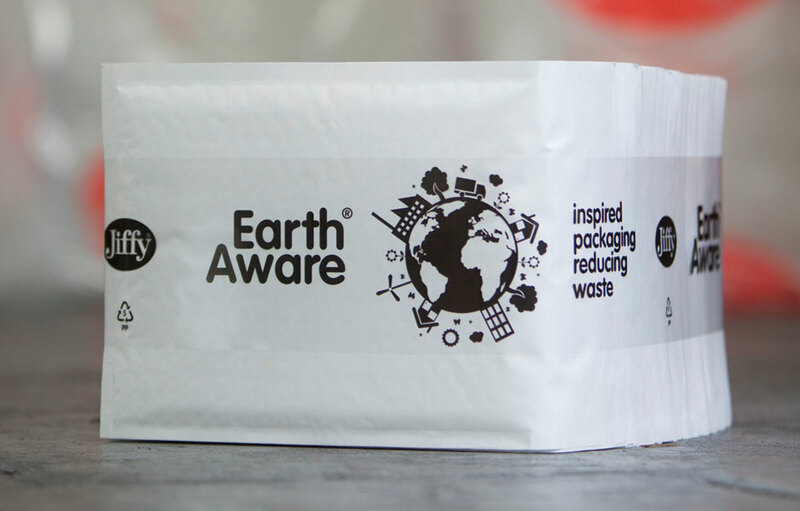 Division Design have produced the new logo and branding for a new Jiffy Packaging initiative, Earth Aware®, a sustainable packaging solution to help customers meet their environmental targets. The new bundle concept for the delivery of its CD, DVD and larger size bubble lined mailers that has eliminated the need for corrugated cartons and created significant transport efficiencies, while still offering a high level of protection for the empty mailers in transit. The Earth Aware® bundle solution binds together 50 mailers with a polypropylene band, followed by shrink wrapping to provide protection against dust and other hazards. As well as the material reductions and increased transport efficiencies, the removal of cartons from the delivery process can help to increase operating efficiencies at the customer, as the bundles take less time to unpack than boxes and there is less packaging waste to deal with. The Earth Aware®bundles have already been well received and successfully adopted by a variety of end user packers and packaging distributors.